The casing of a B-41 thermonuclear bomb. Mark 41 thermonuclear bomb casing at the National Museum of the United States Air Force. The B-41 (also known as Mk-41) was a thermonuclear weapon deployed by the United States Strategic Air Command in the early 1960s. It was the most powerful nuclear bomb ever developed by the United States, with a maximum yield of 25 megatons. The B-41 was the only three-stage thermonuclear weapon fielded by the U.S. The development of the B-41 began in 1955 with a USAF requirement for a Class B (high-yield, over 10,000 lb or 4,500 kg) weapon. It was based on the "Fagotti (bassoon)" test device first fired in the Redwing Zuni test of 27 May 1956. An ICBM warhead version of the weapon was cancelled in 1957 while still in the design stage. The weapon was 12 ft 4 in (3.76 m) long, with a body diameter of 4 ft 4 in (1.32 m). It weighed 10,670 lb (4,840 kg). It was carried only by the B-52 Stratofortress and B-47 Stratojet. It could be deployed in free-fall or aerial (parachute) configuration, and could be set for airburst, groundburst, or laydown delivery. During its operational lifetime, the B-41 was the most efficient known thermonuclear weapon in terms of yield to actual weight, with a 5.2 Megaton/tonne ratio (based on a 25 Mt yield). Its blast yield was 25 to 50% that of the AN602 Tsar Bomba, which delivered a blast of 50 or 100 megatons of TNT, depending on its own configuration as a "clean" (lead encased) or dirty (uranium encased) bomb. 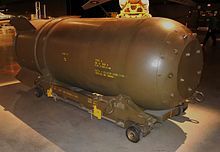 However even at the Tsar Bomba's theoretical maximum yield of 100 megatons, it would still only achieve a yield to weight ratio of ~ 3.7 Megaton/tonne, thus the B-41 is the most efficient, highest yield to weight ratio, weapon ever created. However, since neither full yield versions of the B-41 nor "Tsar Bomba" were ever demonstrably tested, the B-41's high efficiency is merely theoretical; the most efficient tested and proven nuclear physics package is the W56. If detonated at optimal height, the B41 would generate a fireball approximately 4 miles (6.4 km) in diameter. It would have been able to destroy reinforced concrete buildings 8 miles (13 km) from ground zero and most residential structures 15 miles (24 km) from ground zero, while producing third degree burns 32 miles (51 km) from ground zero. ^ a b "The B-41 (Mk-41) Bomb" Nuclear Weapon Archive. (accessed April 8, 2015). ^ a b Carey Sublette, "Operation Plumbbob," Nuclear Weapon Archive, http://nuclearweaponarchive.org/Usa/Tests/Plumbob.html. (accessed December 27, 2006). ^ The B-41 was ...the most efficient bomb or warhead actually deployed by any country during the Cold War and afterwards. http://www.ieri.be/fr/publications/ierinews/2011/juillet/fission-fusion-and-staging. This page was last edited on 4 April 2019, at 08:39 (UTC).